Meet Fido, the mutt who stole Honest Abe’s heart! Before he was the 16th president of the United States, before he presided over a nation embroiled in civil war, before he ended slavery, Abraham Lincoln was a country lawyer with a soft heart for all God’s creatures, big and small. One day, on his way home from his law office in Springfield, Illinois, he rescued a mutt from a band of mischievous boys. When he brought the little dog home, his wife Mary Lincoln wasn’t happy. Dogs were trouble. Dogs were dangerous. Dogs tracked mud into her nice clean house. But, in the end, Abe had his way—much to the delight of his two younger sons. Abe named the mutt Fido, the Latin word for faithful—and a more faithful family dog never wagged tail. Even Mrs. Lincoln came to tolerate him and allowed him to sleep on her husband’s favorite horsehair couch. Fido accompanied Lincoln to the office, on fishing trips with his kids and their friends, and to the barbershop. 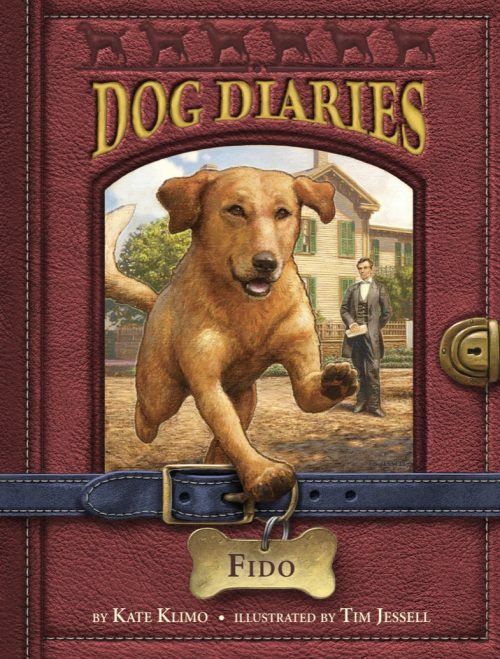 As Lincoln’s fame grew, and he began running for political office, Fido became known as the Lincoln Dog. But the Lincoln Dog liked calm and quiet and each political victory brought with it fresh threats to Fido’s peace of mind: cheering crowds, clanging church bells and, worst of all, fireworks! Lincoln knew that the city of Washington, D.C. was bigger, more crowded, and noisier even than Springfield—and that Fido would not be happy there.When Lincoln won the race for president of the United States, Abe made the tough decision to leave Fido behind with a friendly neighbor—and his beloved horsehair couch. This is the story of the Lincoln Dog, who stayed faithful to his master, even until the day the funeral cortege brought his master back home to Springfield for the last time. There is also a section of interest to all animal lovers on the history of humane societies and legislation.